It’s Durable. Most smartphones are not built for outdoor activity. Humidity, rain, tough terrain, drops and other wear and tear from the trails may be enough to render it useless. Whereas a GPS device is built to be rugged and withstand the elements. Longevity. Most smartphones cannot last more than a few hours with the GPS on. A dedicated GPS device will go on for all day. Accuracy. Techies claim that smartphones and dedicated GPS devices use the same GPS chip. Yet in my experience, a GPS device has a more tenacious lock and higher accuracy when compared with smartphones. Who likes to venture off the beaten trails or explore uncharted areas. Likes to record tracks as insurance to double back or to share with others. Treks through jungles, cliffs or canyons. If you’re not likely to encounter any of these situations then a smartphone might suffice. But, if these scenarios sound familiar, then I recommend getting a dedicated GPS device. The Garmin Etrex 20x is a small, lightweight (98g) and affordable (Rs. 13800–14800) GPS that runs on AA batteries. It features a colour 2.2-inch screen and a large internal memory (3.7 GB). This device uses both GPS and GLONASS satellite systems and can hold up to 2,000 waypoints and 200 routes. It is accurate up to 3 metres in normal use. Other than these changes, the Etrex 20x has the same size and guts as its predecessor. This similarity is not inaccurate as the Etrex 20 was already an accomplished performer. I’ve owned an Etrex 20 for about 5 years and when I decided to replace my lost GPS, the Etrex 20x was a natural upgrade. I bought my Etrex 20x in December 2015 on Amazon India for Rs. 13,800. Garmin Etrex 20x is available on Amazon, Snapdeal and Flipkart (₹ 13,800 - 14,800). Mini-USB cable. Really Garmin? This is 2015, and everyone has chosen Micro-USB as the standard for data transfer. It’s not that I have anything against a mini USB, but it means carrying another cable. User start guide. Since I’d already owned an Etrex 20, I threw this away and downloaded the PDF user manual. It’s far easier searching for a specific word in a PDF file. The GPS device with a screen protector applied. Basemap pre-installed. Basemap provides a relief overview of the world and is useless for trekking. Garmin Etrex 20x weighs just under 100g without batteries. Lifting the GPS out of the box and I was surprised at the lack of heft. The Etrex 20x is lightweight at under 100 grammes (without batteries). Despite its lack of heft, it has got a solid plastic build that feels robust. There are no squeaks or rattles and it feels well-built. A rubber skirting covers its sides and buttons for extra protection. But, because of this skirting, the buttons are hard to press and do not offer a tactile feel. There is a total of 5 buttons on the device. Three on the left (Up, Down and Menu) and the other two (Power/Light and Back) buttons on the right. On the front is a 4-way joystick with a press to click functionality. The joystick is also rubber covered to prevent water ingress. On the back of the device is the battery compartment. This is accessible via a D-ring. Turning the D-ring counter-clockwise reveals the battery compartment and the microSD card slot. The device uses 2 AA batteries and supports lithium, alkaline and rechargeable batteries. A rubber weather cap covers the Mini USB slot on top of the battery compartment. The top has an embossed Garmin branding while the bottom of the device has a lanyard hole. I’ve carried the Etrex 20x on every trek this past year. It's been with me all over the Himalaya in all weather conditions. From a raging snowstorm to a monsoon downpour and everything in between. We've trekked to over and above 5000 metres and have been exposed to temperatures as low as -11 C.
Garmin Etrex 20x at Kalah Pass (4620m) September 2016. The Etrex 20x has a rounded river stone like profile. With its diminutive size and rounded edges, it is easy to slip this into your trousers or jacket pocket. It weighs 156g with Eneloop batteries that make it one of the lightest GPS devices available. The buttons on the sides need a firm press which means they are not inadvertently triggered. On the front, the joystick sticks out about a centimetre above the otherwise flat facade. Since the joystick also doubles as the enter button, it often causes unintentional presses, especially if the device is placed in trouser pockets. There is no way to lock the joystick. Garmin, if you're listening, here's a tip - the power and menu buttons would make an excellent lock device combination. In the meantime, it's best to carry this device on a belt clip or strapped to your backpack. I prefer threading a lanyard through my backpack shoulder strap, which makes the device easily accessible on the trail. Fortunately, the device comes with a lanyard hole at the bottom. There is also a built-in mounting spine on the back that attaches to Garmin bike mounts or their carabiner clip. However, the mounting spine is plastic, which makes it more difficult to connect and disconnect from these accessories. Garmin Etrex20x features a plastic spine on the back. This spine makes it compatible with Garmin's bicycle mounts and carabiner clip. The display on the Etrex 20x is a 2.2 inch transflective, 65-K colour TFT with a backlight. The backlight intensity can be adjusted with one click on the light/power button. We’re glad Garmin made this oft-used setting accessible via a physical button rather than burying it in the setup menu. The display on the Etrex 20x is bright and the screen contrast and legibility are excellent even under direct sunlight. The device uses a sans serif font which is legible and the higher resolution screen reduces jagged edges. The colour screen is a significant improvement over its predecessor and the monochrome Etrex 10. The display really shines when using topographical trekking maps. 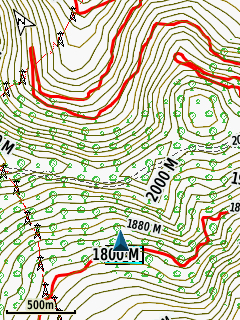 It is far easier to distinguish contour lines from other landmarks when they’re highlighted using distinguishable colours. On a monochrome display, a road or a river looks the same as a contour line at first glance. Another interesting bit is that the device automatically inverts screen colours after sunset. This dark background colour scheme is far easier on the eyes after the sun goes down. But, if you do not like this behaviour, it is configurable via the Setup->Display menu. Since I use third-party topographical maps (see "Maps" section at the end of the review) the map redraw is a bit slow. There is also a brief but perceptible lag when zooming in and out of maps. This lethargy is not slow enough to cause a problem in the field. Yet, it is definitely perceptible when comparing the Etrex against the more expensive Oregon or Montana series from Garmin. The signal acquisition is much faster on the Etrex 20x when compared with its predecessor. I conducted 10 cold and warm starts to test the average Time To First Fix (TTFF). TTFF is the time taken by the device from start to acquire the current position. The TTFF for Etrex 20x were 57 seconds in a cold start scenario and 13 seconds for a warm start. The first time you turn your unit on each day it must perform a cold start. To perform a successful cold start it must have a current almanack i.e. a reasonable expectation of its current location, and a reasonable idea of the current time. Given this data, the only thing it needs in order to calculate a fix is the precise location of 3 (for a 2D fix) or 4 satellites (for a 3D fix). The data it needs is called ephemeris data and it is transmitted every 30 seconds by each satellite in the constellation. It takes 18 seconds to download this information because it is only being sent at 50 bps. Since your Garmin was turned on at a random time with respect to the satellite transmission it can take up to 36 seconds to download this information assuming no interruption. If you turn your unit off and back on again you will notice that it is able to compute a fix much quicker than it did the first time. This is because it saves the ephemeris data from the last cold start. Saving this critical data can enable your unit to compute a fix in 15 seconds or less. It needs only to verify that the data is still valid and that the satellites that it has data for are still available in the sky. The ephemeris data from a satellite is updated every 2 hours at the top of the hour but it is considered to be valid for up to 4 hours. Garmin Etrex 20x provides a 2 to 3 metre accuracy in day to day use. The Etrex 20x, like the Etrex 20 before it uses both GLONASS and GPS satellite networks. In most cases, the horizontal and vertical accuracy are within 3 metres with a clear view of the sky. While this is not exceptional yet, it is still on par with other midrange GPS devices. Yet, due to its small size and built-in antenna, the accuracy goes down to about five metres under a lush tree cover. Still, despite its lowered accuracy the device maintains a tenacious fix. I've never had any missing data on any of my trek recordings. I've also compared the Etrex 20x against various smartphones. 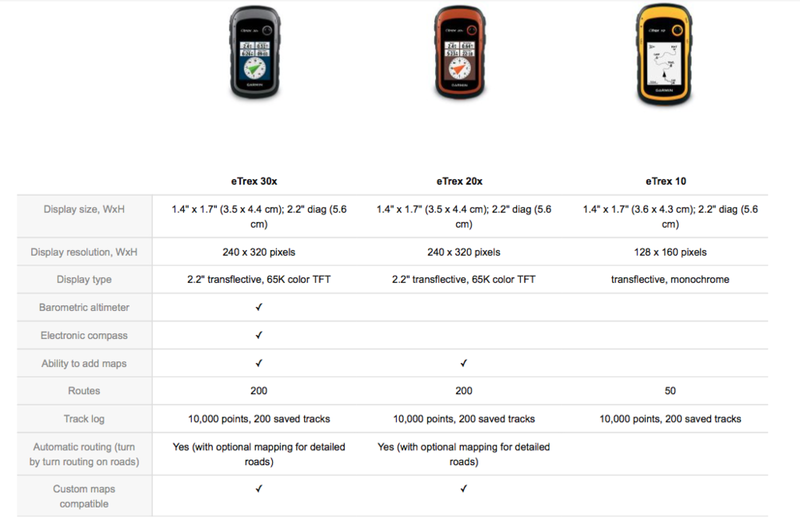 In all such tests, the Etrex 20x was much better at retaining a GPS fix than the latest smartphones. The Etrex 20x is the simplest handheld GPS I have used. While some may lament the lack of a touchscreen, I prefer buttoned devices as they are much easier to use with heavy gloves in winter. The buttons on the sides are ergonomically designed and fall under the ring and middle finger on the right and under the thumb on the left. The user interface (UI) on this device is extremely customisable. It comes with 5 predefined profiles - Recreational, Geocaching, Automotive, Marine and Fitness. Each with its own sequence of dashboards. You also have the capability to create your own custom profile. Besides customizable profiles, the sequence of tabs (called dashboards) on the home screen is customisable as well. You can switch between various dashboards by using the joystick and selecting it by pressing down on the joystick (which acts as the enter button). However, the biggest strength of this device is also its biggest drawback. The joystick that works so well with gloves is a pain to use if you have to type in a piece of text. This is especially true when marking waypoints. To type a word, you need to scroll to each alphabet via the joystick and then click to select that alphabet. This can get infuriatingly tedious. In order to minimise typing in the field, we have devised our own set of two letter acronyms. E.g. WP stands for watering point, BI stands for bifurcation, SH for shelter. On a trek, we mark our waypoints using these two-letter acronyms. Once we’re back, we expand and rename these acronyms on the computer using Garmin's Basecamp software. The Etrex 20x uses two AA batteries for power and its performance can be summed up in one word - outstanding. Garmin claims a battery life of 25 hours and they are not wrong. In general, I average over two full trekking days using my favourite NiMH batteries. This with the track recording running in the background. In fact, I completed the Jalsu pass trek with track recording on all the time, on a single pair of NiMH batteries. At the end of the third day, the batteries still had some juice left in them. Select the correct battery type in Setup->System menu. The three available options are Alkaline, Lithium and Rechargeable NiMH. Most Important! Navigate away from the maps page when you're not using it. This means that the device does not have to constantly redraw maps when you’re not looking. Thus saving processing time and battery. The Etrex 20x comes with a default Worldwide basemap which is completely useless to a hiker. 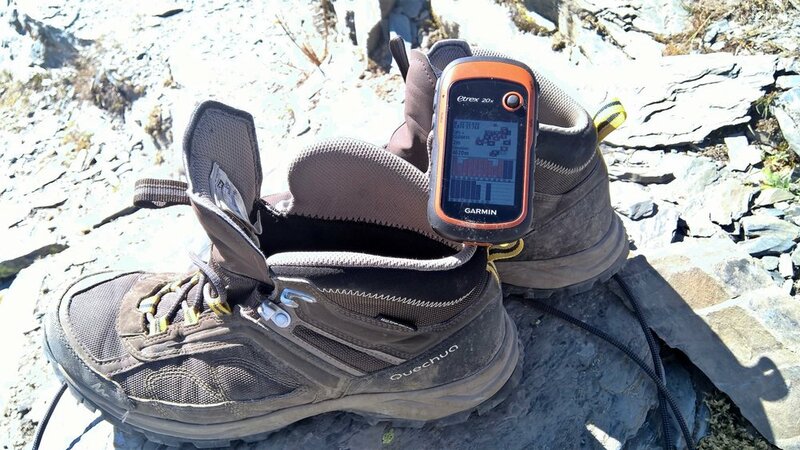 You definitely need better maps for this device if you’re going to use it for trekking. Fortunately, help is at hand via the OpenStreetMaps (OSM) project. OpenStreetMap (OSM) is a collaborative project to create a free editable map of the world. The creation and growth of OSM have been motivated by restrictions on use or availability of map information across much of the world, and the advent of inexpensive portable satellite navigation devices. Just like Wikipedia, OSM is considered a prominent example of volunteered geographic information. You can download OSM maps converted to Garmin understandable format from here. These maps contain Points of Interest (POI) and even contour lines! In essence, you’re getting topographical maps for the entire Indian subcontinent free of cost. If you do choose to use these maps, please consider leaving a donation via the Donate link. Even smallest donation helps keep these servers running. Thank you. 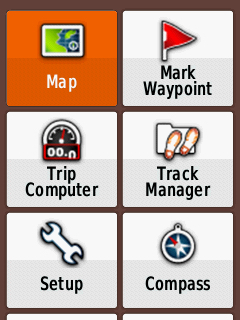 Garmin BaseCamp™ is a free software that allows you to search, edit and share your GPS files. It is available for both Mac and PC. Despite its clunky interface, BaseCamp™ is a powerful GPS editor with the built-in merge, split, rename, reverse and export functionality. It also allows you to update your Garmin GPS to the latest firmware. This software works seamlessly with Garmin’s devices but you can also use it as a general purpose GPS editor. Most manufacturers only sell you the GPS device and that's it. Therefore, we’re happy that Garmin has made an effort to build a complete ecosystem around their GPS devices. 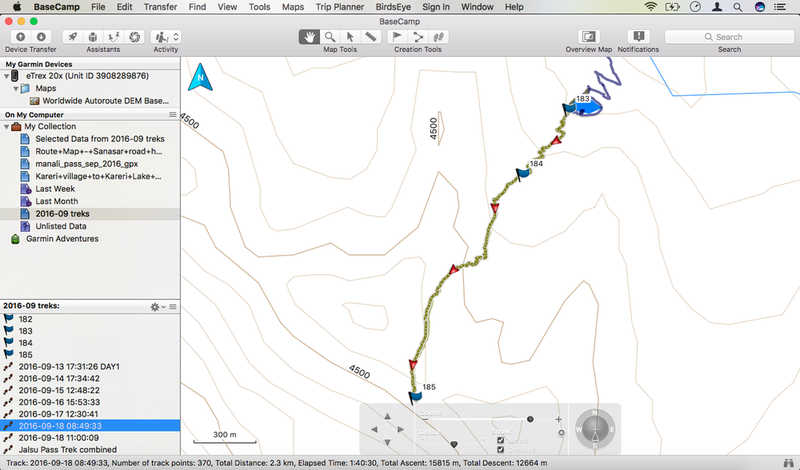 Garmin BaseCamp Version 4.6.3 (4.6.3) running on Mac. Priced around Rs. 13800 the Etrex 20x sits between the Etrex 10 and The Etrex 30x. So let us examine these devices to see if they offer a better value for your hard-earned money. Despite its lower price, we do not recommend the Etrex 10 as a navigation device. It has two major shortcomings: a) it has a monochrome screen and b) it does not come with microSD card support. The lack of expandable storage implies that you lose the ability to store third-party maps. The monochrome screen makes it a chore to separate the contour lines from other points of interest. It is a good choice if you intend to use it only to record your treks. Yet, even as a recorder, it only supports a maximum of 1000 waypoints and 50 routes. The Etrex 30x does everything that the Etrex 20x can and adds 3-axis compass, barometric altimeter and wireless sharing to it. The 3 axis compass is nice to have as it shows where you're heading even when you’re standing still or without holding it level. This is one feature where the 30x scores over the 20x. Garmin also claims that the barometric altimeter is more accurate than the Etrex 20x. Yet, the insider story is that a barometric altimeter is pretty useless unless it’s regularly calibrated. That’s because a barometer uses atmospheric pressure to determine altitude. However, atmospheric pressure changes not just with elevation, but also with the weather. The wireless sharing is nice to have if you own other Garmin gear. But, if you use the Etrex 30x as a standalone device then this feature has negligible utility. The bottom line is that if you can afford it, the Etrex 30x is definitely a better device but it does not have the same value for money as the Etrex 20x. The Etrex 20x is not a general purpose GPS device. This is a device for the adventurer who goes beyond the beaten trail. It is lightweight, durable, simple to use and comes with a crisp colour display and an excellent (25 hours+) battery life. This is one device we have carried on each of our treks, in every possible weather condition and it has never failed us as a GPS navigator or as a data logger. However, even the Etrex 20x is not perfect and it falls short in certain areas. The screen is not scratch resistant which is a surprising omission for an outdoor device. The choice of joystick means that inputting text is a time-consuming affair. It doesn’t come with sharing options like Bluetooth or Wi-Fi and the Mini USB interface means it’s just another cable you have to carry. Nevertheless, despite these limitations, we believe that the Etrex 20x offers the best value not just within Garmin’s own line of handheld GPS but also when pitted against other brands. It ticks all the right boxes and is the perfect choice for any Indian hiker looking for a robust GPS device at an affordable price. Its not often that a piece of gear impresses our entire staff so much that we choose to trust and use it for each of our treks. It is for these reasons that it deserves our Gear Of The Year Award (2016). Inexpensive colour screen GPS device.